There is no doubt the new Blackmagic Cinema camera is a revolutionary piece of hardware - can't beat the $3,000 price point, 2.5K RAW ability, and the 12 stops of dynamic range! Some have even referred to it as baby Alexa. However, one of the biggest complaints has been the EF only lens mount. 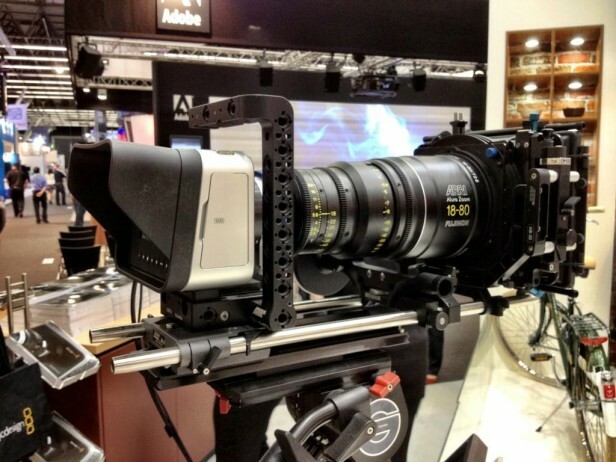 IBC 2012, Amsterdam, Netherlands - September 7, 2012 - Blackmagic Design today announced a second model of the Blackmagic Cinema Camera that features passive Micro Four Thirds lens (MFT) mount, so customers now have an even greater choice of lens options when shooting. The new Blackmagic Cinema Camera MFT model supports any Micro Four Thirds with manual iris and focus, and is also easily adapted to other lens mounts such as PL via third party adapters. The ability to use third party adapters to allow other types of lens mount is due to the Micro Four Thirds lens mount being much closer to the image sensor and allowing space for adapters to other lens mounts. Blackmagic Cinema Camera MFT is identical to the original Blackmagic Cinema Camera model, however does not include lens communication so manual lenses are used. The current model of Blackmagic Cinema Camera will be renamed Blackmagic Cinema Camera EF to let customers easily differentiate between the models.